Think of all the relationships one develops over a lifetime. We begin with our immediate family and other close family members. As we grow, we develop friendships in our neighborhoods and then the schools we attend. We can go on and on with other phases of our lives that result in building relationships: our places of employment, military, church, teams, special interest groups, etc. Many of these relationships may last only for a while. Then we lose contact, sometimes due to circumstances, sometimes due to lack of interest in continuing the relationship. For most of us, the years of employment and raising our families limited the amount of time we could spend maintaining relationships we may have developed over the years. Some of us moved away from the areas where we grew up and distance prevented us from the frequent contacts we previously had with family and friends. For me, retirement has given me the opportunity to re-establish some of those relationships. I began working on my family tree a couple years before retirement, but have been able to pursue it more diligently since I retired. It has been very interesting to find and learn about ancestors, but even more interesting to find and meet living relatives that I never knew about. This past summer, I was able to organize a Froehling family reunion which was held in a small town in Illinois near where I grew up and near where the family had settled after arriving from Germany in the late 1800’s. Family members who had never before met attended. And, it seems that everyone enjoyed each other’s company. Social media has been a wonderful tool in re-establishing relationships. It helped me locate family members to invite to the reunion. I have had more contact with some of my high school and college classmates than I had when I attended classes with them. My wife, Karen, and I both communicate more frequently with relatives and friends using email and Facebook than we ever did before those tools became available. What about the relationships we established at JCI? Are there people with whom you would like to remain in contact and to share experiences in retirement? 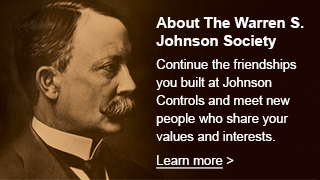 WSJSociety.com offers us the tool to do that. It also offers many other resources. We are grateful to Steve Roell and Alex Molinaroli for their interest in JCI retirees and providing the resources to build the website. Let’s use it to the fullest. Sign up if you haven’t already done so. Encourage others to do so also.